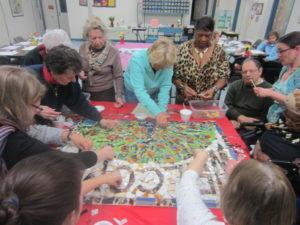 can be a great way to learn, Connection Lab brought a collaborative mosaic as another engaging way for people to come together and talk. The mosaic that we designed and created together was a peacock, a traditional symbol of welcome in parts of Asia. 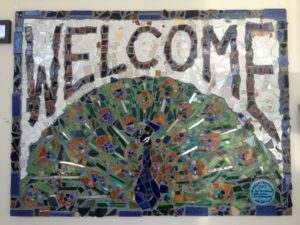 The sign was installed in the entryway leading to the Council’s space, to indicate that the space is shared and all are welcome.